The children have been busy making Christmas cards for our African friends in Musul Primary school. We are twinned with this school as part of ‘The Become a Friend Project’ and have been sharing information with them for almost three years now. We would like to wish all our friends and family abroad a very Happy Christmas. Beannachtaí na Féile chugaibh agus athbhliain faoi shonas is faoi shláinte aghaibh. 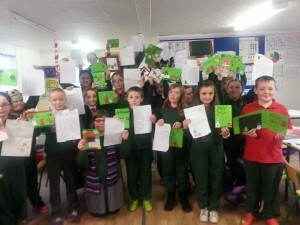 Fuair rang a 4, 5 agus a 6 litreacha ar ais óna gcáirde pinn i nGaelscoil Uí Riordáin i gCorcaigh. Bhí gliondar agus sceitimíní áthais orthu agus iad a léamh. Tá cártaí Nollag déanta agus freagraí scríofa, iad ar fad curtha ar aghaidh acu an tseachtain seo. 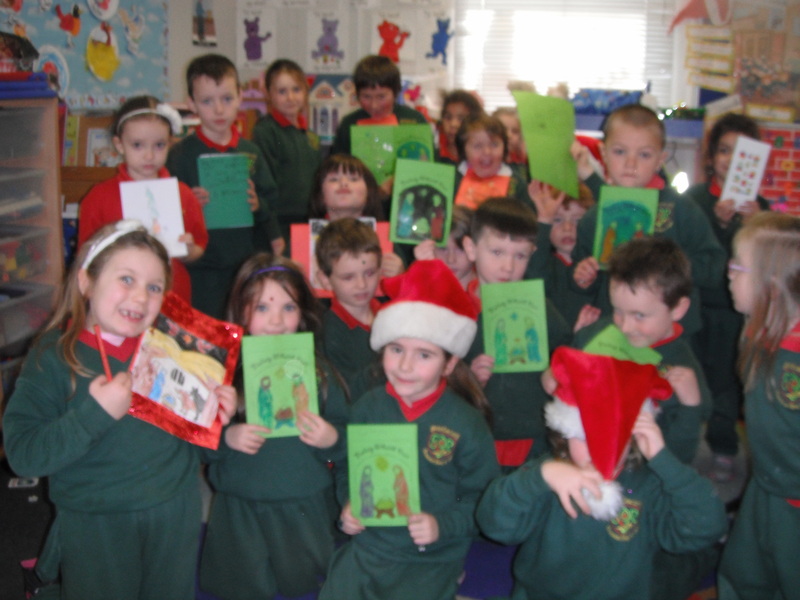 Rang a 4, 5 agus a 6 have been sending Christmas greetings closer to home. They have become penpals with children from Gaelscoil Uí Riordáin and have sent letters as well as Christmas cards to them all this week. Nuacht Scoile Tá deireadh na bliana tagtha. Bhí céad téarma ana mhaith againn. 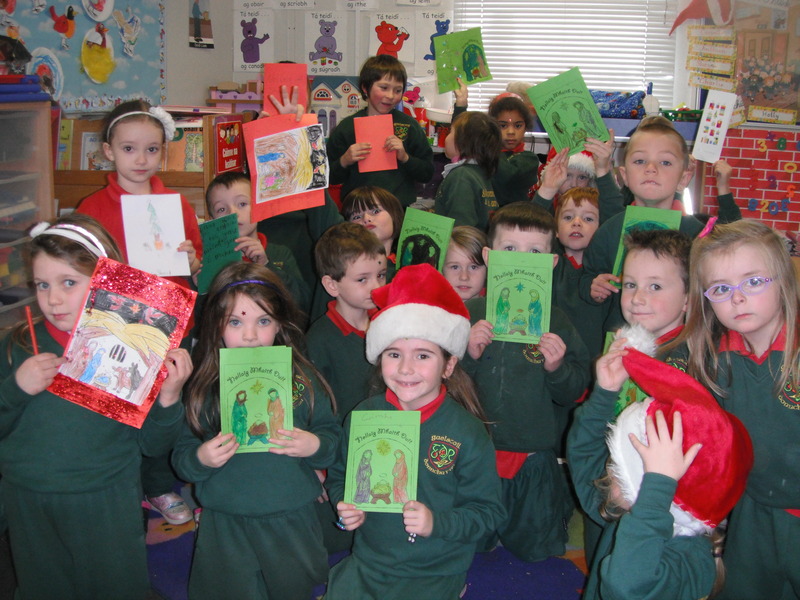 Rinne gach éinne an dul chun cinn i ngach slí.We are coming to the end of the first school term and are all looking forward to the Christmas festivities in school over the next two weeks. Senior infants to sixth class will attend the ‘Little Shop of Horrors’ that the students in St.Caimin’s have kindly invited us to attend on Wednesday the 10th of December at 10:30am. The cost of this show is €2 and all proceeds will be donated to St.Vincent de Paul and Fighting Blindness.We would ask that the children contribute €1 towards the cost of the bus on the day, bringing the total price to €3 each. Go raibh maith agaibh. As you are aware the school is taking part in The Escalation ( Music Generation Clare) singing Programme this term. On the 18th of December Rg a 4, 5 agus a 6 will be joining the other schools involved in a Christmas performance that will be held in Shannon Airport. The show will begin at 1pm and all parents are welcome to attend, táimid ag súil go mór leis! Comhghairdeas!Congratulations to Celtan Delaney on his win with the Shannon Kick Boxing team. He won a gold medal for winning his fight. Maith thú Celtan! Ceolchoirm/ Christmas Concert: Naíonáin bheaga, Naíonáin mhóra agus Rang a 1 have been very busy preparing for their Christmas concert. They will perform a number of songs and poems on Wednesday the 17th of December at 10am. We would be delighted if parents could attend. Cuairt ó Dhaidí na Nollag/Santa Claus : Daidí na Nollag will visit the junior classes on Friday the 19th of December. The children will all receive a gift and have a chance to chat to Santa before he jets back to the North Pole. Múinteoir Aisling will help him organize the presents and a contribution of €2 would be greatly appreciated. Go raibh míle maith agaibh! Cainteoir na Seachtaine:All the children have been making such a huge effort with labhairt na Gaeilge ar scoil. There have been many free homework passes given out to children that are really trying hard and we would like to congratulate each and every one of them. Míle buíochas paistí, tuismitheoirí, caomhnóirí agus feighlí. Finally we would like to thank all the parents/guardians , families and child- minders for all the great support and co-operation throughout 2014. We are delighted with the progress that has been made and we look forward to a very productive school year in 2015.May you all enjoy a peaceful, stress free Christmas and a delightful New Year ! Guíonn foireann na scoile agus an Bórd Banistíochta Beannachtaí na Féile chugaibh agus athbhliain faoi shonas is faoi shláinte agaibh. The staff and Borad of Management wish you all a Happy and prosperous New Year. Linda will be re-opening the Playschool on Monday the 12th of January. All new children are welcome. School will close on Friday the 19th and re-open on Monday the 5th of January 2015.